A Wonderful Cornbread Recipe/Soup too! 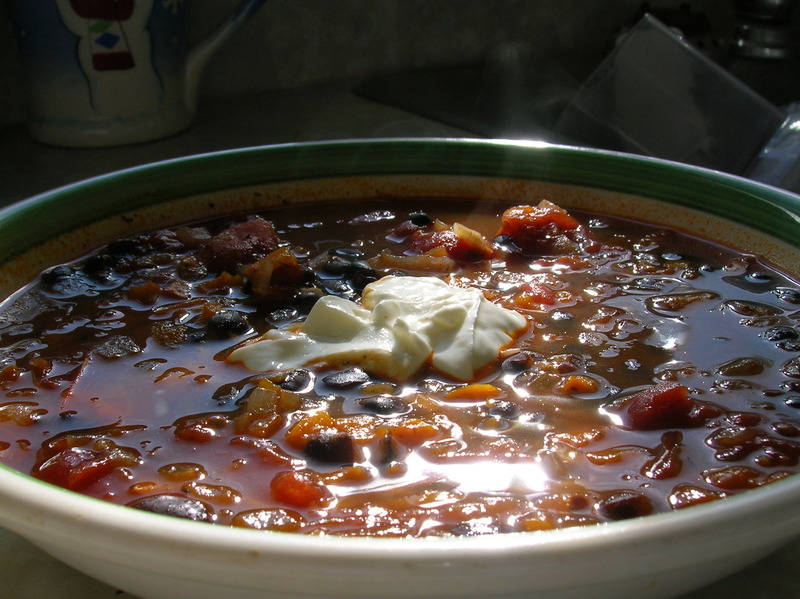 What is black bean soup without cornbread to accompany? Just not complete, I’d say. I found this amazingly moist cornbread recipe over at About.com (yes, I do make and enjoy other people’s recipes ;<) LOL) and it is a keeper. The cornbread is delish but don’t make more than what you plan to eat on any given day. It doesn’t freeze well and dries out quickly. I’m going to make a batch later today as I’ve got this soup on the menu for tonight’s supper. I may give it a try as muffins this time. A few personal preferences/tweaks: I usually make it in a 7″ x 11″ baking pan, instead of the 9″ square as the recipe suggests. I also adjusted the oven temp. down to 375F. It was browning too fast at the higher suggested temp. Could be the oven here though, they all vary a bit. I also used only 2 large eggs and decreased the baking powder to 2 teaspoons, salt to 1/2 teaspoon. And if you haven’t tried the Turtle/Black Bean soup yet, it makes for a perfect culinary duet! I have made that soup and it is to die for. I will try it with the cornbread this weekend. YUM! You take the most beautiful pictures of your food! I’ve been trying lately and it’s a lot easier said than done, so to speak. I’ve never had a corn bread that I actually liked so it will be fun to try again on a recipe that comes recommended. The turtle soup is a different story. When you posted this one on VTH, I immediately gave it a try and now it’s a keeper. Especially after I treated myself to a pressure cooker….amazing! Black beans in 22 minutes. Hi Ruinwen, Tastes yummy too. And very filling. Hi Sel, I’m so glad you enjoyed the soup. Hopefully your family too. The cornbread, a perfect side. Hi Tania, How nice to see you again. Your comment was in my spam filter, go figure. Im glad I checked tonight, hardly ever do. Thank you for your kind words. I’m glad you enjoyed the soup too. One of several new recipes I’ve created in the past few months.